When it comes down to affirmations for love, you are incorporating the power of the subconscious mind. Which thrives off of repetition. Whatever you say with certainty and do so over and over, you naturally bring that thing into your life. We create everything that happens to us in our lives with this power that has been bestowed upon us. So the more you affirm your self love affirmations, the more love and happiness will come into your existence. This is the basics of the law of attraction. What you think about, you bring about. Where your focus goes, energy flows. It is a way to reinforce the positive. Because our minds are naturally negative. And unless we catch our thoughts or become aware of them, we will be co-piloted by negative thought patterns. Positive love affirmations can help us reinforce entirely new thought patterns. Hence changing and transforming out lives in ever way, shape and form. Many of our thought patterns based upon love are based upon what we believed during our childhood and developmental years. And if we are being honest with each other, no one had a perfect childhood. But by becoming conscious of these limiting beliefs, we can break these thought patterns with some or all of the positive love affirmations I offer you below. But can the power of affirmations help anyone and everyone? Or is it only for certain people? Well my friend, I believe that anyone can for the sheer fact of the matter that we ALL use affirmations already. Any thought that you dwelled upon is an affirmation. For example if you really wanted something bad in your life, you dwelled upon it. So heavily sometimes that you started seeing things that were related to this goal or desire. And the more you did this the more things like this showed up in your life. Then one day, it actually came into your life. This is the use of affirmations. Positive or negative, we all use affirmations. 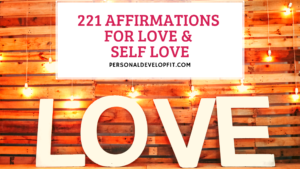 But with the list below, you can become confident in creating the love and loving relationships you want because you will be affirming it in a positive way. Hence creating more positivity in your life. Enough talk, let’s get into it. I hope this list brings you value. I am perfectly deserving of having love flow abundantly in my life. My soul attracts loving and loving people wherever I go. I love all of my flaws and accept myself completely. The more loving I become the more love that comes into my life. I embrace love as the most powerful force in the world. I know that love comes from within hence this is why I seek happiness from within. Love is always part of my day. I seek to give love in all areas of my life. I know that true love exists and is coming closer and closer to me on a daily basis. God loves me and I love Him. I am loved and completed accepted. I love my past, present and future. I love myself even when I don’t feel loved from outside sources. I love myself through all that happens in my life. Love is my legacy that I give to this world. I have so much love in my life right now. I see love wherever I go in this life. My dreams and reality are filled with love. I bless other peoples love and loving relationships because I know it brings more love into my life when I do so. Love permeates throughout my body and soul. I choose only loving and accepting thoughts and feelings. I replace negative thoughts with loving and forgiving thoughts. My God loves me fully and completely. I completely deserve all the love I get. I have love for everyone on this earth. I love my career and job. My colleagues and family members love and accept me completely. I love the lessons that life has taught me. I care and love myself completely. I only participate in acts that are self loving and love based. Love is the most powerful force in my world. I love just as I would like to be loved. My loving acts return love to me in tenfold. I am thankful and grateful for love. I am perfectly capable of giving and receiving love. I love my children and they love me completely. People know me most for being a loving and compassionate person. I feel confident in my own life because I know that I am deeply loved. I love my passions and my energy for them. I love my energy and vitality for life. I love that I make the best choices that support my love an happiness. Love is me and I am love. My level of love evolves to higher levels each and everyday. Love is bestowed upon me my strangers and from random sources. I love my clients and my clients love me. I seek to act from love in all that I do. The love for my kids and spouse grows and grows each day. I place all importance on love, that is why it shows up so much in my life. Love is the most powerful force in the universe and I use that to my advantage. I dissipate any negativity in my life with loving thoughts. I choose love and I see love where others may not. Love is my top core value and dictates everything I do in life. I see, feel, taste, hear and smell love wherever I go. I am in a deep and loving relationship with my spouse. I commit myself to a life long love affair with myself. I commit to constantly growing my level of love throughout my life. I pray for more love and wisdom. I know that I am here on this earth to love and be loved. It is better to love than to be loved. I make my day and the day of others by being loving. I am deeply in love with my life. Love flows to me from unknown sources. I embrace love as the way to happiness. I use freewill to bestow love on all creatures of this world. My family adores be and fills my life with love. I am constantly meeting loving people who becomes great friends. Wherever I go people feel my love deeply. Love and romance fill by days completely. My heart is wide open to love. The universe loves me and wants the best for me. I only love I know and give in unconditional love. My love for the world grows each and every day. I only see my future being filled with love. I love and am thankful for my past and what life lessons it has taught me. I use love as my guiding force in life. Love is my rod and my staff. My purpose here on earth is to being a living embodiment of love. Love feels so good and I feel great all the time because I am always loving. I love my parents and forgive them completely. Love is the one thing that matters most to me. I am so fortunate to be able to love and be loved so much. The more unloving people are the more loving I become. I am manifesting my soul mate into my life. I create my own happiness with love. My relationships are deeply fulfilling and loving. My thoughts are always and only positive about love. I allow the universe to flow love to me in abundant amounts. I feel the love of God all throughout the day. I love the progress that I am making in my life. Love is to me food for the soul in which I eat abundantly. I love myself enough to treat myself with love and respect. I see love as a way of life, not an emotion. Love is attracted to me and I am attracted to love. I can enter into my happy place anytime throughout the day by giving love. All my relationships are deeply intimate and loving. Love is the motivating force behind everything that I do. I can’t help but feel loved in every room I walk into. Love is always my main priority. The only thing that truly matters is love. The way I love evolves more and more each day. I feel deeply loved in nature. My own nature is love and I love reminding myself and others about this. I open myself to new forms of love each and every day. I attract loving and forgiving people. Each person that comes into my life is an opportunity for me to bestow love on them. I know my levels of love are never ending so I never act other than abundantly when I give it. I welcome love into my life with open arms. My good listening skills bring more love into my life. I love all the gifts that come to me. My love comes through my passions. The world is impacted by my love. I add much substance to the world through my love. I am perfectly capable of transforming the world with my love. I see everything through loving eyes. I see everything through God’s eyes which are only loving. I am attract the most loving and congruent people into my life. I understand people perfect because I seek first to understand them. Which is the most loving point of view. I commit today to engaging in only acts that will support creating a loving nature in me. I understand myself because I love myself completely. I find new ways to love myself and others more each day. Unconditional love is what people feel when I am around. I am a living embodiment of the true example of what love is. When people think about me, they only feel loving feelings. I am recognized by my family and peers as a loving and giving person. Each time I feel bad, I remind myself that I can feel great by giving love. I am intimately connected with the love that flows through the universe. Love is what I teach to others for I am always giving it. I find the love in all of life’s lessons. Love fills my body and soul completely with warmth. I matter fully and completely. My loves grass is never greener on the other side. IT is most green on my side because I water it there. I am warrior for love for I fight to give it and receive it for all of my days. I heal my own wounds with love and forgiveness. I let go of all grudges by simply loving the negative thoughts and feelings. I remind myself that love is never a feeling but instead love is me. I never point the other finger when I know I can simply love the person instead. I prioritize love over winning arguments. I would rather show my love than to be right. I am constant re-energized when I bestow my love on people and things. I love like a perfect mother would love, with loving devotion of a pet. Feelings of love ease my anxiety and quiet a loud mind. Because I commit to a loving nature, I forgive my enemies fast and readily for resentment has no place in my life. I open myself up to all forms of love. I don’t define love for I know that it has no definition. I let my definition of it evolve. I can feel safe and secure at any time in my life because I have the power of love. Love never comes from anywhere but inside myself. I don’t seek love outside myself for I know that is not the path to happiness. I feel free and comfortable to express all forms of love. I stand firm and grounded with love. My vision of my life makes me happy and fulfilled as I know it will be full of me giving and receiving love. My love is strong and capable. I believe in my ability to love because I know it is any my true essence. I call upon God to help me love more and bring more love into my life. I live like like Jesus and Buddha did, only centering all my acts in love and growth. Love flows through all of my creative acts. If I am not in love with my career, I know I have the freedom to seek a job or employment I will love. I never compromise my love for anyone. I hear the loving thoughts and intentions even through other peoples negative speech. I will never not be happy because I have the power to love. My spirituality grows each day for I am always seeking and engaging in loving acts. The people that come into my life have only loving motives and wish to love me fully and completely. I have the power to make bad days good through engaging in loving thoughts. People in my life love me for exactly who I am. I naturally attract my life purpose by being loving. I am thankful for my ability to love endlessly. Love and loyalty is what I attract on a daily basis. Love follows me wherever I go. I know that love is truly the only abundant force in this universe. Love and romance flow through my life with ease. I never desire love for I know that when I want, I am lacking. So instead I give it instead of want it. Hence, then I have it. Each day, more and more love comes into my life. I love every single aspect of my life. I am constantly reminded of the power of love because I am constantly using my endless source of it. My happiness and love and intertwined in a perfect union of bliss. All my conflict in life is solved fast and effectively for I give loving vibrations always. I attract love into my life abundantly. Love shines from within me. I know kindness is never weakness, therefore my actions are always rooted in love. My partner loves me completely for exactly who I am. I am deeply accepted and loved by my mate. The universe has brought me and my partner together for a perfect union of love. All relationships that come into my life are abundantly loving. My loving nature is attracting my perfect soul mate into my life. The more love I give the more I can get from my spouse or one I want most. I enjoy being completely loved and treasured by my mate. I in complete love with my spouse. I remarry my lover everyday because we continue to fall deeper and deeper in love with each other. I commit to never giving up on our love. I feel positive about my life for I know that I am loved completely by my mate. I know love never boasts or brags therefore I am always creating a field of true humility about the levels of love in my life. I renew my vows daily with feelings of intimacy and love with and for my mate. The universe is always attracting me my perfect match. As I seek my soul mate, my soul mate is seeking me. Hence getting me closer and closer to them the more I dwell up it. My marriage is so deeply rooted in love it will never waver. I have complete confidence in my ability to show my partner they are loved. There is complete love and devotion flowing through my relationship. I am completely confidence in expressing my love, adoration and intimacy with my partner. I know my partner and I are completely meant for each other. I love strangers for them become friends this way. I love all my friends and am thankful for the loving relationships in my life. My friends know me as their most loving companion and confidant. I am always restoring old friendships with love. New relationships are always flourishing in my life because they are centered in love. My friends lean on me because I bestow love on them and never judge them. I know that all my friendships are forever because their origins are in love. The roots of my friendships have deeper and deeper roots of love. I see the love in people immediately. Whether I meet the for the first time or we have been friends forever. I develop loving chemistry with ease around new and old friends. I love passionately in all of my relationships. People are always showing me how much they love me. My friendships permeate with love. There we are my friend. 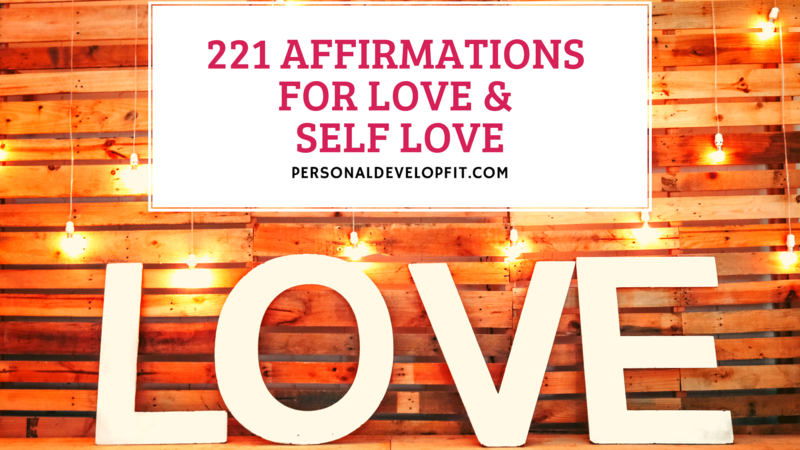 A compilation of affirmations for love that are all framed in the positive for you. To help you harness the power of affirmations through the repetition of them. Repeat them daily. Anywhere from 10 to 50 times. My tip is to do so right in the morning when you’re mind is most impressionable and open to suggestion. Prime yourself for a day full of love. You can also do so throughout the day to counteract negative love thoughts and affirmations that you have been priming yourself to think subconsciously. Share with me what your favorite love affirmations were and if you have any good ones to add! Let’s chat in the comment section below!